ADDENDUM: Slight year update from catalog based on the labeling period. Sportscaster Bob Costas once said, “Stan Musial was nicknamed ‘The Man’ not just for all of his career accomplishments. He was nicknamed ‘The Man’ not just for his 17 Major League records, his 29 NL records or his 9 All-Star records at retirement. He was nicknamed ‘The Man’ as much because of who he is and always will be, one of the most consistent, decent and honest human beings to ever play Major League baseball. All Musial represents is more than two decades of sustained excellence and complete decency as a human being." Few players in the history of the game so engendered the admiration and affection of fans, not only at home but in every ballpark on the circuit. As for his 22-year tenure with the Redbirds, there's no specific era during which he peaked. Rather, Musial was spectacular his entire Hall of Fame career. 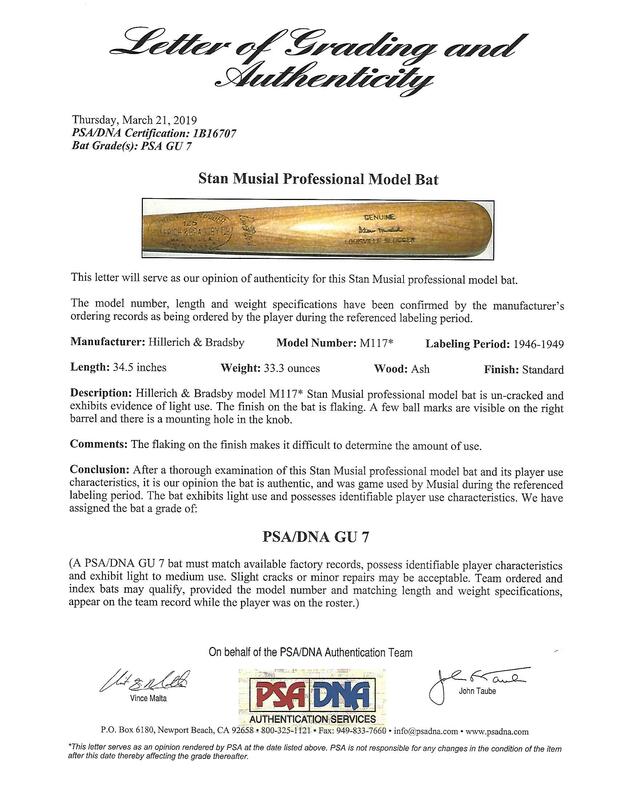 Presented here is a 1946-49 era Hillerich & Bradsby 'M117' Musial signature model ash bat used by "The Man" during a torrid hitting stretch when he won two National League MVP awards, two batting titles and belted 110 home runs with 452 RBI in a four-year span for the Cards. The 34 1/2", 33.3 oz. 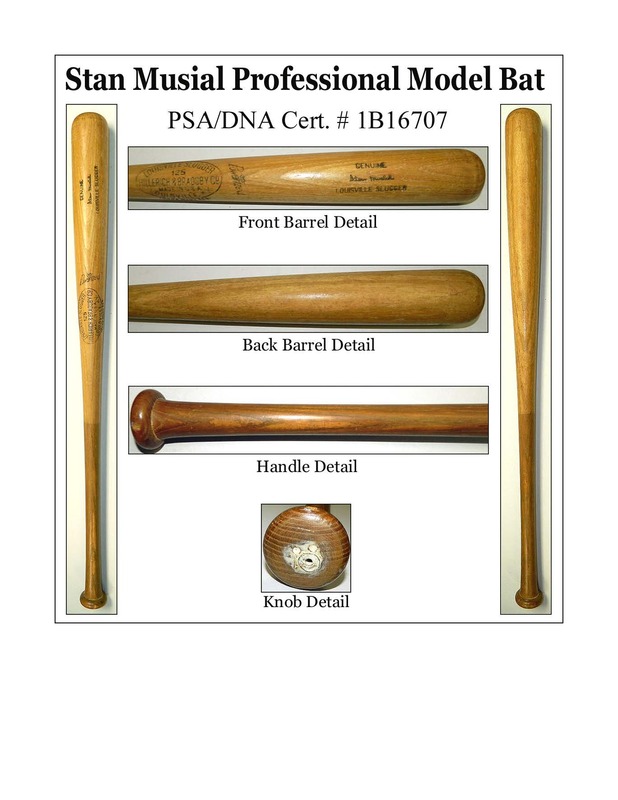 is uncracked and exhibits light use with ball marks visible on the right barrel. According to bat expert John Taube, "flaking on the finish makes it difficult to determine the amount of use." 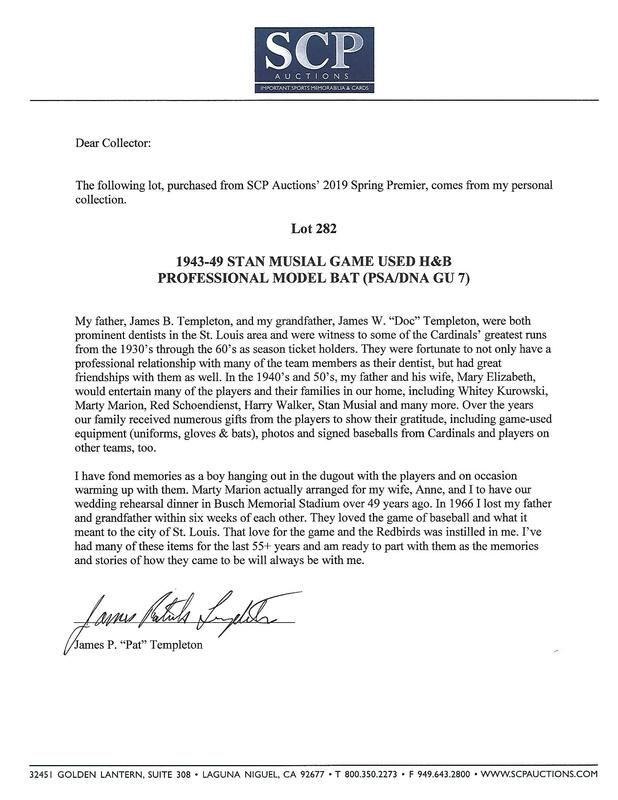 There is a mounting hole (from how it was displayed by our consignor) on the knob that obscures part of the model number, but does nothing to detract from the striking visual attractiveness of this vintage gamer used in the prime of Musial's legendary career. Includes LOA from the family of the St. Louis Cardinals' team dentist in the 1940's and 50's. 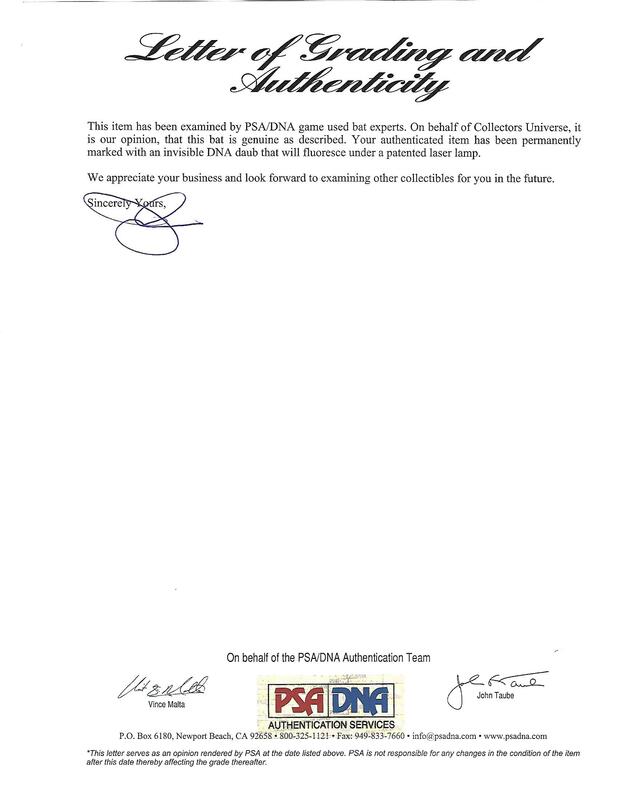 LOA from John Taube of PSA/DNA (GU 7).